Great attention to detail with respect to the amenities in the cabin. Owner did call and notify us that the propane tank was empty and the fireplace would not function. The hot tub cover has seen some wear and tear. Difficult for one person to open and close. Very private setting. We just got back from our weekend at a stone cottage and we loved it. It is very clean and seemed to be relatively new in construction. 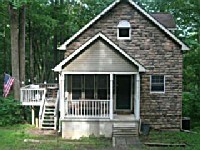 It has some really great amenities, with a full kitchen, plenty of room, two large decks and a very large hot tub. Being pet friendly we took our Great Dane and he loved it and spent most of the time sitting in front of the fireplace. There is no cell reception there so you are truly cut off from everyday distractions. The sights are roughly a 25 minute drive but through some pretty scenic areas. Overall we recommend it highly! A Stone Cottage is a fantastic getaway spot. This cottage was even better than I expected. What a great place to relax, sit by the campfire, eat wonderful meals, relax in the hot tub, watch a movie or two. You can also play the George Game while you are here! My stay was comfy and cozy, quiet and relaxing, and overall, just a ton of fun was had by all. I really had a hard time leaving. Thanks to the owners for putting so much thought into making our stay a wonderful experience. You thought of everything. I will be back, you can count on that. I just returned home from Hocking Hills. My stay was at A Stone Cottage. We had a wonderful family weekend at the cottage. We had a little trouble finding the cottage because we could not find lot 50, but the sign "A stone Cottage" was at the driveway. While at the cottage we spent lots of time just relaxing on the decks while eating our meals together. Many hours by the campfire-plenty of wood on the trails. A stone Cottage has all the conforts of home-without all the interuptions of cell phones or computers. We were able to spend time playing games, talking, and cooking together. George game was our favorite. I will tell other people obout our weekend away at A stone Cottage and how blessed we felt to spend time together! The cottage is stocked with about everything you need. Including Games, movies, books, spices, hot chocolate, coffee, towels, shampoo, conditioner. All the comforts of home. We loved it!